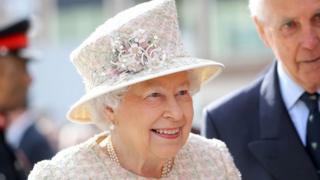 The UK should mark the Queen's 65th year on the throne with a bank holiday, a Conservative MP has said. Romford MP Andrew Rosindell said it would be a "missed opportunity" not to have a national day of celebration. He will present his Queen's Sapphire Jubilee Bill to the Commons on Tuesday, in a bid to set aside a day in June this year for commemorative events. The Queen became the first British monarch to reach a Sapphire Jubilee on 6 February. In 2015, she became the UK's longest-reigning monarch, aged 89. Mr Rosindell said: "It's almost certainly going to be a very long time before any monarch gets anywhere near 65 years. "It's the first time we've had any Sapphire Jubilee and if we let this go by, and don't have some sort of national day of celebration, it'll be a missed opportunity. "It's also for the young people - I remember the Silver Jubilee [in 1977] as a kid and learnt how important these national occasions are." Although he is putting forward the bill, Mr Rosindell said he understood the Queen was a "very modest" person and did not necessarily expect or want huge celebrations. He has suggested a day of events similar to the Queen's Diamond Jubilee in 2012. He said: "I have personally spoken to Theresa May about the idea and she was certainly positive in her approach to this. What other milestones have been marked with a bank holiday? In 1977, the Queen marked her Silver Jubilee with street parties. As part of the celebrations honouring her 25 years on the throne, the Queen named several landmarks, including the Jubilee Gardens on London's South Bank and the Silver Jubilee Walkway route in the capital. She also renamed a line on the London Underground as the Jubilee line, even though it was not due to be opened until 1979. The Queen's Golden Jubilee in 2002 was marked by celebrations nationwide, including a royal tour and a pop concert featuring guitarist Brian May playing a God Save the Queen solo from the roof of Buckingham Palace. In 2012, the Queen celebrated her Diamond Jubilee and street parties were held across the UK to mark her 60th year. The Red Arrows flew over Buckingham Palace and thousands gathered along the Mall to honour the monarch.